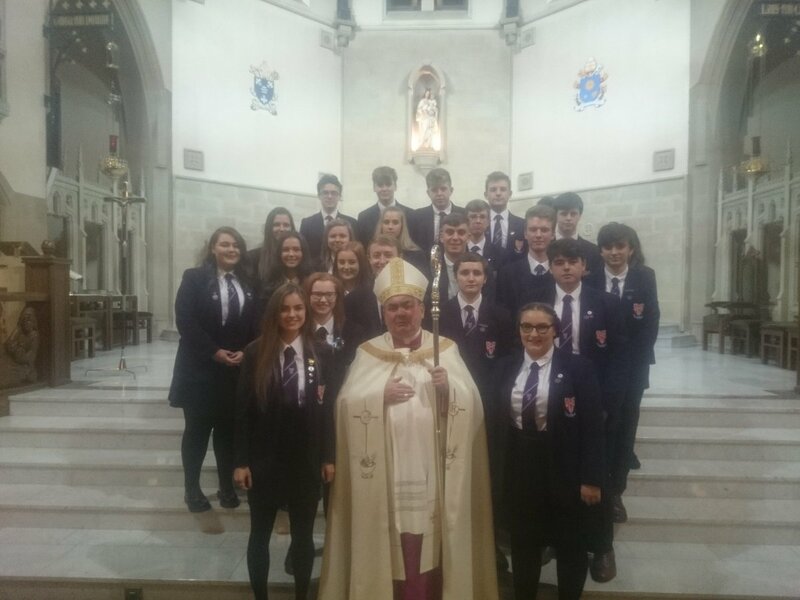 S6 Caritas pupils attended a Caritas Commissioning Service on Monday 19th September. At this service, Caritas badges were blessed and given to pupils as an outward symbol of their faith journey. The S6 Caritas group have organised a series of inter-house events which begin 12th September. For one week, pupils from each House will battle to gain the title of ‘Winning House’ for the whole year. The winning House from each event will be the one which gains the most points. However, pupils can also gain points for their House by giving to a charity- nominated by their own House- during R.E. We look forward to celebrating the many gifts and talents of the pupils at OLHS, whilst raising money for charity, as part of our faith mission. On Thursday 16th June, the new S6 Caritas pupils will be attending an Aid to the Church in Need Rally at Carfin Grotto. ACN Scotland invites Catholic high schools from all over Scotland to stand in solidarity with persecuted Christians worldwide. ACN call on the Scottish Government to promote faith and freedom around the world. It is hoped that Caritas pupils will gain knowledge about the persecution of Christians throughout the world so that they go on to make a positive impact on social injustices. Our Lady’s High School was well represented at the recent Caritas Award Ceremony, on Wednesday 3rd June, at the Clyde Auditorium. It was a fantastic experience to see 41 pupils from Our Lady’s High School rewarded for their commitment to their faith when they were presented with their Caritas Award. The Caritas Choir’s hard work and endeavour was duly recognised when they were invited to contribute to the Opening Prayer and Closing Reflection of the Award Ceremony. The performance of the Caritas Choir was both inspirational and spiritually uplifting. Well done to all involved. The S6 Caritas Choir visited Park Springs Care Home on the 18th of December to perform a Christmas concert to the residents and staff. The choir sang various Christmas songs and the staff of OLHS donated boxes of chocolates for the residents. Thanks to Louise Bradshaw, Dominic Cherrie, Michael Clark, Aidan Coates, Caitlin Connor, Shavaun Goodman, Aaron Hawthorne, Darcey Hendry, Katie Anne Hunter, Monica Kane, Emily McCafferty, Jill McMurray, Jordan Mooney, Lisa O’Rorke, Michael O’Rourke, Scott Price, Hayley Stevenson, Callum Wilson. The Caritas Choir took themselves off to St Andrew’s Hospice on Wednesday 19th November to perform for staff and residents. All S2 pupils recently attended a retreat based on theme of “Hearing God’s Voice” at The Diocesan Centre, Newmains. The retreats were led wonderfully by Nicky Lynas from the Pastoral Centre and Father Stephen Reilly from St Bernadette’s Parish, ably assisted by a team of enthusiastic young volunteers (many of whom were OLHS former pupils) who gave up their free time to help out. Each retreat was also accompanied by four 6th year Caritas candidates. The pupils, who attended the retreat in R.E. class groups, enjoyed a series of activities based on the theme of the day. These ranged from a perfume/after shave smelling test (designed to show us that what we think of as valuable isn’t always right) to creating a Facebook page for Jesus! The pupils also enjoyed the guided meditation led by Nicky in the beautiful chapel which was a very peaceful and calm exploration of a different way to pray and reflect. Everyone enjoyed a sing-a-long Grace before meals – “We will thank you’ (based on the Queen song – much banging of tables and clapping took place), a hearty lunch and a chance to run around the grounds of the Centre. S2 also had the opportunity to create their own prayer cards based on the day’s theme of hearing God’s voice and responded very well to this. Thanks to all the staff who assisted with the retreats and the S6 Caritas students who helped too. 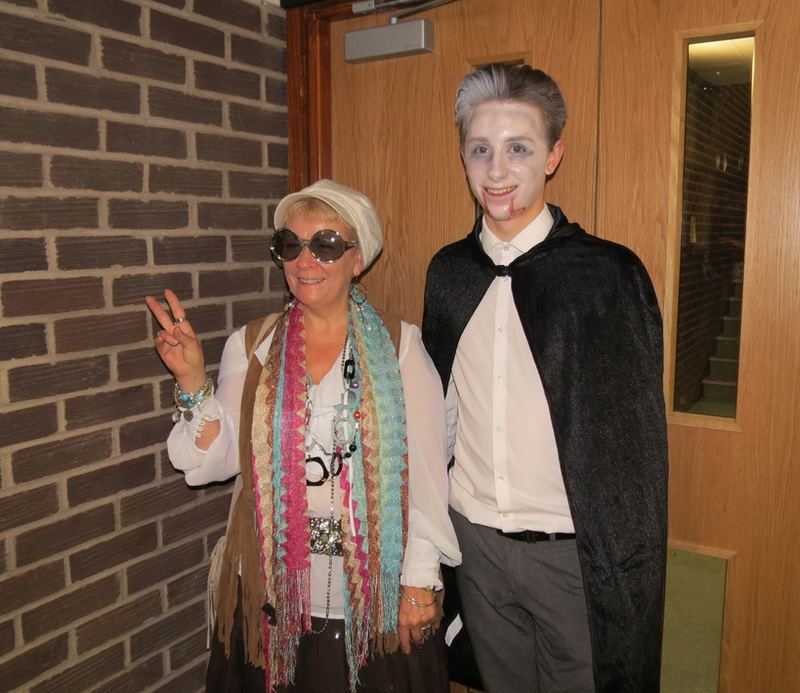 The Caritas SCIAF group organised a Halloween fundraising event on 31st October. 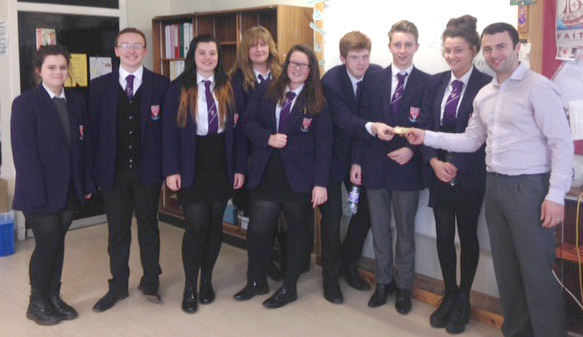 Pupils in the group persuaded members of staff to dress up and obtain sponsorship from their pupils for doing so. Many teachers enthusiastically participated and costumes sported on the day included a tube of toothpaste, zombies, a hippy chick, a leprechaun, a whole coven of witches and Wally. The group managed to raise £275 through this event, taking their running total to £605. The group would like to say a special thank you to all staff members who took part for supporting their charity fundraising endeavours. On Tuesday 28th October, Mrs Mulholland and some of our Caritas students enjoyed Holy Hour of Eucharistic Adoration for Vocations to the Priesthood and Religious Life in St. Patrick’s Parish, Shieldmuir. Several invited clergy spoke about their call to vocations, including our own School Chaplain, Fr Frank King. A group of S6 Caritas students met with Mark Booker from SCIAF to take part in the Talented Fundraisers project where they plan to use their gifts and talents to raise money for SCIAF! 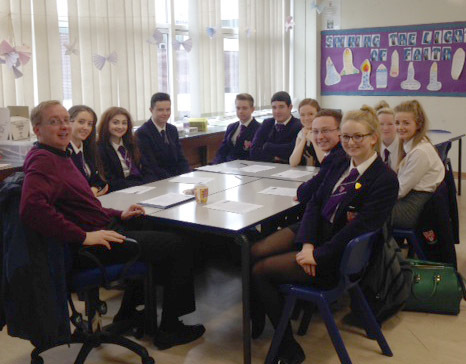 Father Stephen Reilly from St Bernadettes Parish visited the school to meet with the Caritas group members who will be taking part in faith witness activities within his parish. Last night, this year’s Caritas S6 were comissioned during Mass in Motherwell Cathedral and most of last years S6 Cathedral Parish Caritas Award recipients were there to support them. Afterwards everyone all went into the Chapel House where Monseignor Millar had laid on a lovely tea. A number of this year’s Caritas S6 will also attended the Annual Vocations Mass in the Cathedral on Monday tonight along with Mrs Sinclair, Mrs Mulholland and Miss McGinness. Priests from local parishes came to OLHS to discuss how pupils could fulfil the parish activities element of their Caritas award. Caritas pupils from Cathedral Parish will be enrolled at Mass on Sunday, followed by a meeting in the parish house with former Caritas pupils. Congratulations to Sam Kelly and Stephen Ross who represented Our Lady’s last night at a special dinner in The Bentley Hotel hosted by the Motherwell Rotary Club. Sam spoke about his experiences in Our Lady’s, particularly highlighting his sixth year, which included experiences in Caritas and the Duke of Edinburgh Award. He went on to tell the assembled audience about his plans to go to Africa to assist with a building project for young people for which he is currently fund-raising. Stephen also talked about his time in Our Lady’s and the expectations which the teachers have of our pupils. He went on to describe Caritas, Duke of Edinburgh and his experience of volunteering in Bothwellpark. 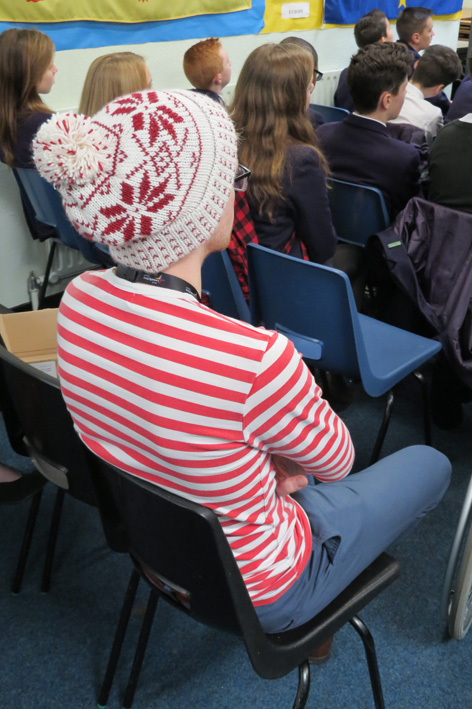 The audience also heard about the fantastic trip to CERN. Both boys did a great job and were complimented by the assembled club members, receiving a a token of their appreciation for their efforts. Well done to both Sam and Stephen who did the school proud. Pupils from our Caritas group and other volunteers walking, rowing and cycling around Syria to raise funds for Aid to the Church in Need. During November, TJB and myself were involved in our schools fundraising for the WW2 Veterans through our involvement in Caritas class. For our “Faith Community” hours, we spent RE and free periods selling poppies to raise money for “Poppy Scotland”, creating a display of religious symbols associated with WW2 and poppies with the names of family members, neigbours, etc. written on them of people who died during the wars or were still serving. Each year group got involved by doing different activites during November in their RE classes, some of which included: 6th year sing-a-long, 2nd year making religious symbols for the display, etc. All this was done for the Poppy Scotland organisation who fund war veterans, serving soldiers and their families to help give them a stable home and the support that is much needed. A big thank you goes out to Mrs Mulholland, Mrs McGuiness and the Caritas class for helping us raise money and showing how much we care for our heroes. However, more importantly, thank you to everyone who donated to PoppyScotland by buying the poppies and getting involved with our display. Miss McGinness, Mrs Mulholland and a group of S6 Caritas Students visited Park Springs Care Home in Forgewood yesterday to perform a Christmas concert for the residents. Students sang Christmas carols and played a variety of instruments. Staff members of Our Lady’s donated boxes of chocolates that the Caritas group delivered on their trip as well. Miss McGinness would like to thank everyone for donating chocolates for the residents and staff of Park Springs. The Caritas pupils are looking forward to visiting again in March.